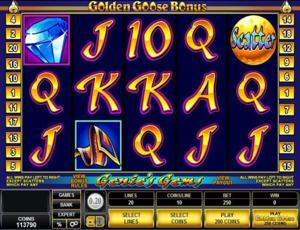 Golden Goose - Genie’s Gems is an online video slot machine game released in July 2005. It is offered exclusively at online casinos powered by Microgaming. This video slot game has 5 reels and 20 pay lines. The theme of Golden Goose - Genie’s Gems is, about a Genie who can grant you all the gems and riches you want just by rubbing the magical lamp, as well as a generous Golden Goose that can also reward you with lots of amazing prizes with her golden eggs! Hop aboard an exciting magic carpet ride and collect your gems and golden eggs! The theme mostly centers on a magical slot game that will reward you with giant-sized payouts – as long as you manage to get a hold of the Magic Lamp and rub it to summon out the Genie! Many online slot players who have played the Genie’s Gems 5 pay line slot game say that this new one with the Golden Goose is much better as it has 20 pay lines and more features that can give everyone many chances of winning nice amounts of prizes! Microgaming online slot games are available to players in 2 formats – download and no-download. Whether you like to download their software first or you prefer to play instantly without the need to download, then Microgaming surely has online slot machine games to accommodate your every slot gaming preference. Golden Goose - Genie’s Gems is a slot game that belongs to the download category, which means you must download first before you are able to play this particular slot game. If you think about the title of the game, you may likely imagine that it’s a cross between Aladdin (genie) and Jack and the Beanstalk (golden goose), which is actually a great combination as both means you can get substantial wins! The Golden Goose - Genie’s Gems online video slot game features scatter wins, a wild multiplier symbol, a Golden Egg Bonus Feature game, a Golden Reels Bonus Feature game, Money or the Egg Bonus Feature game, Pick a Card Bonus Feature game, a maximum coin jackpot of 8,000, and a maximum cash jackpot of $16,000! The quality of the graphics and sound that Microgaming provides is absolutely incredible and top notch. They have a reputation of making the most stunning graphics and true-to-life sound effects that will truly transport you to “that specific theme” they used in any of their slot games. Most people love to play games incorporated with Microgaming software because they have smooth animation and engaging yet non-interfering sounds. In Golden Goose - Genie’s Gems, players are given a fun magic carpet ride to the Arabian desert, where they will find a magic lamp and summon out the genie. This genie is rather a special one, as it can only grant you precious gems! Oddly, the magic carpet also takes you to the land of the giants, where a generous golden goose is determined to give riches to anyone who rescues her. The symbols are drawn in a cartoon-like fashion, and even if they are vibrantly colored, you will play here for a long time because it will not hurt or strain your eyes. Simple animated programming is used on the symbols when you successfully hit winning combinations. The overall graphic design of Golden Goose - Genie’s Gems mostly displays the vibrant color of the night sky, which is dark purple and black. The line indicators, reel icons and the game logo are all embellished in gold to signify that this slot game is also home to the generous Golden Goose. Other colors used include blue, yellow, red, green, brown, black and white. There is no constant background music when you play the Golden Goose - Genie’s Gems online slot game. When you spin the reels, humming sounds that go with the theme of the game is played out. If you manage to form winning combinations, short Arabian-style music will fill your ears to rejoice in your wins! The card deck symbols available in the Golden Goose - Genie’s Gems online video slot game are 10, J, Q, and K. The regular symbols that you will find in Golden Goose - Genie’s Gems are the Golden Minarets, Magic Carpet, Genie’s Lamp, Genie’s Gem, and the Saber. The Wild Symbol is the Genie. It is a wild multiplier symbol. Thus, the Genie wild symbol not only acts as a substitute for all other symbols (except for the Scatter symbol) in order to you help you form winning combinations, but it also can multiply the payout! The Genie wild symbol triples (multiplier x3) the payout of any winning combination it completes, as long as it acts as a substitute symbol. You are paid varying prize amounts (refer to the Payout table) when you manage to form a winning combination with multiple Genie wild symbols on an enabled pay line. Take note that the Genie wild symbol winning combination payouts are not tripled. The Scatter Symbol is the Magic Ball. The scatter symbol is not required to appear in a line (on an enabled pay line) for you to win. The Magic Ball scatter symbol can be found scattered anywhere on the 5 reels, and you are able to form winning combinations as long as there are 3 or more Magic Ball scatter symbols that appear. Your winnings are calculated by multiplying the Magic Ball scatter symbol combination payout (refer to the Payout table) by the total number of coins you’ve bet. Please take note that if you get a scatter win and a regular win, then you are paid out for both of these wins, because the Magic Ball scatter symbol is not required to come out on an enabled pay line for you to win. Scatter awards are independent from pay line awards, and thus they are added to the pay line win. The Golden Goose Bonus Feature game in the Golden Goose – Genie’s Gems online slot game is composed of 4 different Golden Goose Bonus games wherein you can win either random bonus prizes or Free Spins. Please take note that all the pay lines must be activated in the Golden Goose – Genie’s Gems online slot game. To be able to play the Golden Goose Bonus Feature games, you have to place an extra bet of 5 coins per line as a side bet. After each spin of the reels, the Golden Goose will appear randomly and will award you with a chance to play one of the four bonus games. The Golden Egg Bonus Feature game can be activated randomly after spinning the reels. The Golden Goose will walk across the reels from the left and will give you an Egg that contains a bonus prize amount of up to 2,000 coins. Once the Golden Egg Bonus Feature game is over, you will be returned back to the main Golden Goose – Genie’s Gems online slot game, and your bonus prize wins are included to your overall balance. The Golden Reels Bonus Feature game can be activated after any spin. It occurs randomly. Eggs will be displayed on the 5 reels. Each egg contains a certain amount of coins. Select one Egg from each of the 5 reels. Up to 5,000 coins can be won in this bonus game. Once the Golden Reels Bonus Feature game is over, you will be returned back to the main Golden Goose – Genie’s Gems online slot game, and your bonus prize wins are included to your overall balance. The Pick A Card Bonus Feature game can be activated after any reel spin. It occurs randomly. Simply choose a Card to determine how many Free Spins you can get. The Golden Goose will then give you an Egg that contains a random multiplier amount for your Free Spins. Up to 11 Free Spins with up to a 6x multiplier amount can be won in this bonus game. Once the Pick A Card Bonus Feature game is over, you will be taken back to the main Golden Goose – Genie’s Gems online slot game, and your bonus prize wins are included to your overall balance. The Money or the Egg Bonus Feature game can be randomly activated after any spin. You are given two choices: the Money (which can give you up to 10,000 coins) or the Egg (which can give you up to 50 Free Spins and a 3x multiplier for all winning combinations formed). Once the Money or the Egg Bonus Feature game is over, you will be taken back to the main Golden Goose – Genie’s Gems online slot game, and your bonus prize wins are included to your overall balance. Golden Goose - Genie’s Gems has 5 reels where you may bet on 20 pay lines. The minimum bet is 0.01 and the maximum bet is 0.20 per pay line. You can wager from 1 up to 10 coins per pay line bet. Therefore, the maximum bet amount is 40.00 per spin. With the Golden Goose Bonus bet, the max bet amount is 50.00 per spin. Please take note that the amounts mentioned are in Pounds, but they will remain the same if you choose to play in US dollars, Euros, or Canadian dollars. Also, for every coin that you wager, you will enable another pay line. You will be paid out for winning combinations on enabled pay lines only. The maximum payout in the standard Golden Goose - Genie’s Gems online video slot game is 8,000 coins per line bet. People who regularly play online casino games naturally love to stay longer on online slot games that have an Autoplay function. Good thing that Golden Goose - Genie’s Gems comes with this function! In Microgaming online slot games, they have 2 game modes – Regular mode and Expert mode. You can have the game spin automatically for you with the Autoplay function that can be found by clicking the Expert button (located at the lower left portion of the game screen). After customizing the Autoplay function to your preferences, just click on the Start button, and the game will automatically spin for you while you just sit back, relax, and enjoy playing this magical Genie and a generous Golden Goose-themed online video slot game!